As I sit here prepping this post, I noticed something odd, or not odd perhaps. My top 5 consists of a Brit and 4 Canadians. Not much bias on this blog. My Top 5, in no particular order. It is that time of year once again, the dreaded top 10 lists. To milk this as much as possible, I am dropping 3 posts on you. Number 17 to 11, then 10-6 and finally my top 5. How do 17 songs end up on a top 10 list you ask? Simple my blog and I can do what I want. Seriously though, I have trouble picking my favourites and couldn’t whittle it down anymore than this. I did leave some great music on the side unfortunately. So without further adieu, I give number 11 to 17, completely without any further yapping from me, just the music. Heard this on CBC2 today during an interview she was doing and had to post it. 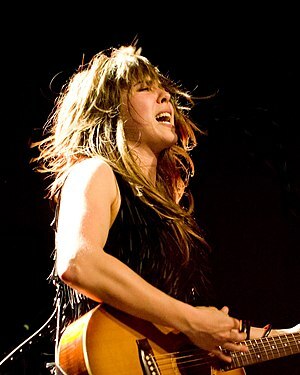 Serena Ryder is the next big thing. The vocals on this are amazing, almost Adele, yet different, kind of like Aretha, yet different, and a dash of Amy Winehouse. This is the exact performance I heard. Sit back and enjoy “For You”. Oh, and get the album “Harmony”, you will not regret it. Singer-songwriter Serena Ryder has released her new album today, “Harmony”. This is her 6th album to go along with 6 EP’s and 3 live compilations. Her music has elements of folk, mixed with contemporary alternative and a touch of country. Her career path is taking her on the steady path to stardom as each album garners more notice and critical acclaim. CBC2 in Canada plays a steady diet of her old and new material, for which i am thankful. I have inserted two tunes off the album. The first is “What I Wouldn’t Do” which is a contemporary indie style song and the second is an out-and-out rocker called “Stompa”. Both are representative of her work.